US President Donald Trump vowed yesterday that people who pushed "evil" claims he colluded with Russia would be investigated, after special counsel Robert Mueller found there had been no conspiracy with the Kremlin. Mr Trump said that those making the allegations over his 2016 election conduct had been "treasonous", adding that they "will certainly be looked at". The White House went on the attack after claiming "complete exoneration" from Mr Mueller, despite the fact the special counsel himself did not clear Mr Trump over obstruction of justice. Sarah Sanders and Rudy Giuliani, the president's press secretary and lawyer, demanded that Democrats and the "liberal media" who talked up collusion apologise. Lindsey Graham, the Republican senator, demanded a new special counsel to investigate FBI and Justice Department officials who began the probe. The main findings from the 22-month probe came in a four-page memo from William Barr, the attorney general, and amounted to a major political victory for the president. The Democrats are demanding the full report be made public and its underlying documents be handed to Congress. They are also vowing to continue investigations they started after taking back control of the House of Representatives in January, something which will be harder to justify now. 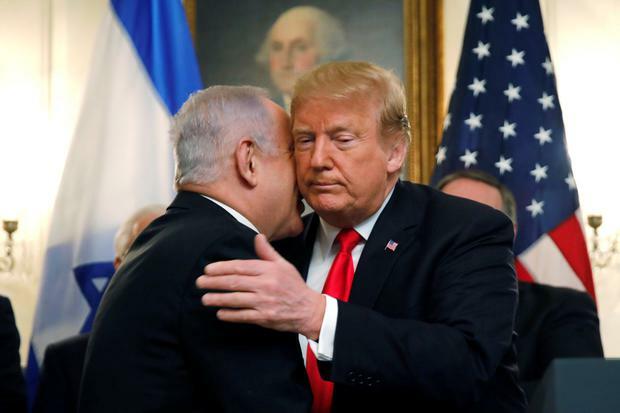 Speaking alongside Benjamin Netanyahu, the Israeli prime minister, yesterday, Mr Trump lashed out at those who pushed the collusion claims and expressed relief the probe was over. "I love this country as much as I can love anything - my family, my country, my god. But what they did, it was a false narrative, it was a terrible thing," Mr Trump said. "There are a lot of people out there that have done some very, very evil things, very bad things, I would say treasonous things against our country... [and] those people will certainly be looked at". Mr Trump also said "yes" when asked if he believed Mr Mueller had acted honourably - a marked contrast to his criticism of the investigation as a "witch hunt". Mr Mueller concluded the Kremlin did intervene to tip the election for Mr Trump, but that neither Mr Trump nor his campaign aides conspired with the Kremlin during the campaign. It was Mr Barr and Rod Rosenstein, the deputy attorney general, who decided Mr Trump had not obstructed justice - a decision Democrats have questioned, given both were appointed by the president and reached the judgment within 48 hours of the report being submitted. Mr Barr's four-page summary of special counsel Robert Mueller's investigation left Mr Trump "gleeful", according to aides. "There was no collusion with Russia, the most ridiculous thing I've ever heard," Mr Trump said. The extent of his victory could be tempered, though, if Democrats succeed in their push for Mr Mueller's complete report to be released and the documents reveal questionable behaviour by the president. Democrats have made it clear that they are prepared to summon Mr Barr to testify under oath. For nearly two years, the probe had been a source of great anxiety and stress in the halls of the West Wing. Aides described Mr Mueller's findings as a best-case scenario that would buttress the president's mood, solidify Republican support and allow Mr Trump to present a better message for re-election. "What they do is they clear the deck for there to be an evaluation based upon his record as president," said former New Jersey governor Chris Christie, a Republican and Trump ally. Aides say Mr Trump plans to highlight the cost of the probe and call for the firing of members of the media and former government officials who he claims made false accusations about him. "It's a shame that our country had to go through this," he added. "To be honest, it's a shame that your president has had to go through this." One former White House official said the Democrats have "just handed the Trump campaign the greatest election issue in modern political history, on a silver platter". Douglas Brinkley, a presidential historian at Rice University, said: "Trump actually kind of has inoculation now against other charges against him because he was able to prove his innocence here. "It allows Donald Trump to build his narrative about how the news media and the Democrats created this whole Russia collusion hoax, in Trump's mind."